Originally known as Paint Service, our Hammersmith Brewers Decorator Centre has been supplying painter decorators and homeowners in the area for decades. 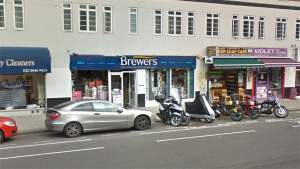 As our regulars have come to expect, a relatively small Brewers store can stock a large range of products, from trade and designer paints to essential decorating tools and equipment. We also have a selection of wallpaper books with thousands of patterns to choose from. If a product you’re interested in isn’t in stock, you can use our customer internet terminal to order it into store. And our friendly team is always available to give you product advice. Our store is on the A315 Hammersmith Road, opposite a distinctive office block called Griffin House and diagonally across from Latymers pub. There’s parking available and we can also arrange for local deliveries. Keep in the left hand lane on to Hammersmith Road. Once on Hammersmith Road, the store is on the parade to the left. From Kensington High Street, continue on to Hammersmith Road. Continue on Hammersmith Road until you see the store on the parade on the right.